We have launched an independent academy of built human environment in Taipei. The Ruin Academy moves in-between architecture, sociology, environmental sciences (including urban design) and environmental art. At the moment the Ruin Academy feels like a nomad camp of architecture and circus commedia dell’architettura. The Academy occupies an abandoned 5 story apartment house in central Taipei. The house used to be a student dormitory for the near-by university. Dormitory is a bit too much to say though: the floors were divided into small chamber with light-weight walls, practically no natural light and with many students in living in each cell. No space, no air movement but total air-conditioning and absolutely no horizon. It felt like a plastic and pink concentration camp. During the first workshop ‘Anarchist Gardener’ we ripped off all the walls and even removed the windows in order to take the architecture back to its original raw concrete structure. To avoid rain and typhoons blowing straight in we planted bamboo through all the window openings. For food we started to farm vegetables in the 2nd floor and of course also the bamboo shoots are eatable. We have running water, toilets and we did build a proper Finnish sauna in the 5th floor. Luxury of the tropics: the sauna is all mahogany. The raw space is beautiful and smiling as total bio-climatic architecture. There is enough shelter to keep dry and sleep with a reasonable amount of mosquitoes. On the other hand it also rains inside: we drilled 6 inch holes through the floors from the roof to the basement. There are spaces for students and professors to live and work in the ruin. 4th floor is an open fire-place and a small stage for DJ’s and bands. So far we have been farming, eating, talking, working, partying, sleeping and bathing in the ruin. 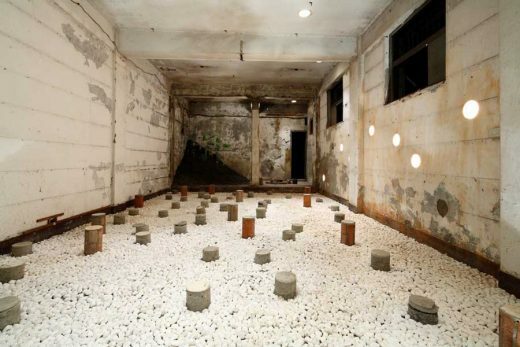 The Ruin Academy workshops that will follow will focus in the ruining processes of Taipei City ? how nature and human nature are keeping the machine alive. All research and design is based on Local Knowledge rather on official data. The Ruin Academy is operated in co-operation between Casagrande Laboratory / Finland and JUT Foundation for Arts & Architecture / Taiwan.